Deep in the hollows of the Shudder Mountains, old folks sit on their porches and tell tales of curious happenings. Outsiders consider these stories fanciful fables, but the Shudfolk know better and harken well to their grandsires' yarns. 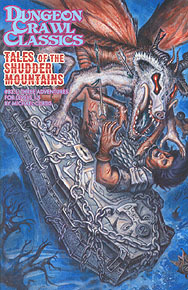 Tales from the Shudder Mountains contains three of these legends, each with a related adventure set in the old hills of the Shudders, the setting of DCC #83: The Chained Coffin. From a tale of a haunted bridge to the evil secret on Darkweather Mountains that only the experienced PC might survive, this supplement adds new depth to the campaign and fits inside The Chained Coffin boxed set for easy storage. So come on back to the Shudders, friends, because there's new tales awaitin' you in the hollows!